The Funky Felter: Christmas is coming sooner than you think! Anyone else have Christmas decor on their mind? I know. I know. I know. It is not even Halloween yet and every store is rolling out the Christmas decorations. I actually don't mind so much. Although I have managed not to purchase any Christmas decor yet, I like to see what is available for ideas on decorating my house both inside and outside. Currently, I kind of have a thing for burlap. It has been popular for a while, but I just now started using it in craft projects. I'm feeling a lovely rustic Christmas coming on for my own house. 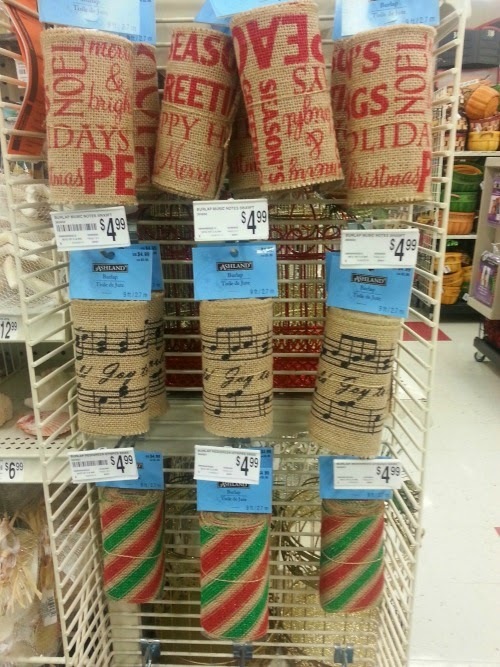 The pretty burlap ribbon at Michaels would be ideal as garland on a small Christmas tree. I can't wait to start experimenting soon, but I promise to get past Halloween first! Do you have any Christmas decorating plans? Modern, vintage, rustic? Please share your inspirations in the comments!